Somehow I'm down 1 pound. Not sure how or why. I ate CRAP - fast food, a frappachino, pizza twice. But I did use my under the desk pedal bike pretty much every day! This week I really need to get my food choices back on track. She had a cold/flu this past week that made her eating go out the window, too. She's frustrated with her poor choices and possibly erasing past progress. Her husband is finally home from the hospital! She did not go to her WW weigh in, but this week she plans on working out 4 days, staying within her points, and sticking to her meal plan. She is maintaining her current overall loss of -1.4 pounds. Her goals this week are no soda, cardio workouts during her lunch break, and menu planning! Good job everybody! It seems some of us have hit a speed bump, or have had a lot going on with sickness (in our family or us). I'm really proud that we're still reporting to each other and making attempts to get back on track. Even if we stumble, it is such a good thing to acknowledge that and to make the effort to chug forward with new goals to achieve. My mom has these old VHS exercise tapes. Two of them are awesome - 8 minute arms and 8 minute legs. I loved them so much I bought my own copy from Amazon and had Johnny upload them onto his computer then burn them in DVD format. I get really discouraged/ADD when working out. These are really short and to the point. Each repitition is only 30 seconds, so just when I'm starting to get bored it switches. It even has a countdown and visual progress so I can SEE how close I am to being done! The host's name is Jaime Brenkus (what a hottie! wink wink) and he also has 8 minute buns and 8 minute abs, although I haven't done either of those. Check for them on Amazon, and also maybe on Netflix or YouTube! How about we commit to a short term goal and report back in one month (week 11 update) to see if we succeeded? This was Mel's idea, and I think it's great to be able to meet small goals on our way to our overall goal. I propose that we don't drink any soda until the week 11 update! If you're in just let me know in the comments or on the Facebook wall! I advanced to stage 2 of Marx Food's Ridiculously Delicious Challenge! Each of us that advanced were sent a mystery box containing eight ingredients. We have to use two of them in this recipe. I chose an unlikely pair: saffron threads and dried tart cherries. While researching saffron I came across a Swedish tradition called Lucia Buns. These are rolls, laced with saffron, baked during the feast of St. Lucia, on December 13th. The rolls are traditionally formed into an "S" or a cross of two "S" shapes and studded with currants or raisins. I chose to replace the traditional dried fruit with the dried tart cherries. I started with a plain yeast roll recipe and worked from there. In the bowl of your stand mixer, add the warm water and yeast. Let sit a few minutes to dissolve and start to foam. Next, add the boiling water, cold water, and melted butter to the mixer, beating on low. Beat the egg and add that to the mixer with the salt. In a small bowl, mix the sugar and the saffron threads. Using the back of a spoon, grind the saffron threads against the abrasive sugar. Work them together for a few minutes, breaking the saffron up until it becomes fragrant and mixes throughout the sugar. (A mortar and pestle can be used here if you have one.) Add this to the stand mixer. Now, 1/2 cup at a time, gradually add the flour. The dough will be sticky and start to pull away from the side of the bowl. Let run for a few minutes on low speed until the dough gets a shiny, smooth look and is very elastic. Oil a large bowl and turn the dough out into it. Let it rise in a warm spot for at least an hour until doubled in size. Punch down. Form into 12-14 balls. With floured hands, roll each one into a cord about 8-9" long. Shape onto a greased baking sheet in the shape of an "S."
Mix the second egg with a couple tablespoons of water and beat. Brush lightly onto the tops of the rolls. Stud the center of each curl in with a dried cherry or two. Let rise another 30-60 minutes. Bake in a 400° oven for 12-14 minutes, until golden brown. Let cool on a wire rack. Delicious eaten warm. Johnny and I could barely wait for these to get off of the baking sheet to try them! They poufed up so beautifully, I was actually really proud of myself. This is my first success with baking rolls! I've never been able to get any results better than dried out, hard pucks. The insides were speckled with a fantastic bright yellow from the saffron. I would say that the saffron's presence in the roll was more of an aromatic experience, tasted through the sinuses and the back of the throat, versus a strong flavor on the tongue. I loved the tart cherries on the top, it was a startling sour, chewy treat on an otherwise fluffy cloud of comfort. I'm glad I didn't wait for December 13th to make these! Johnny and I will be enjoying them for breakfast and snacks for a few days. Voting for the Ridiculously Delicious Challenge will be held March 1-4th. If you like my recipe, I will post links and tweet when it is time for you to vote! I found a hidden gem in the last door of the frozen food aisle. Up on the top shelf, nearly out of sight. It's an inconspicuous 2 pound package of frozen, wild caught salmon, plainly packaged with no flashy graphics or name brand. The filets are individually wrapped in vaccuum sealed pouches for convenience. Regular price is $12.99, but it's been on sale a couple times over the past few weeks for only $9.99. Johnny isn't usually a seafood fan, but with that deal (and a similar one on cod) I'm definitely cooking with fish a lot more lately. I haven't heard any complaints yet, so I'll keep it up! This recipe was inspired by a sea bass recipe in one of the culinary mystery novels I've been reading. Preheat oven to 400°. Spray a 9 x 9" square baking dish with nonstick cooking spray. Lay the filets in the bottom and sprinkle with salt, pepper, and garlic powder. Chop the onion, mince the garlic, and mix these with the frozen spinach. Spread this mixture evenly over the salmon. Season with the salt, pepper, and garlic powder. Cover tightly with foil. Bake for approximately 30 minutes, until the salmon begins to flake and the onions are tender. Remove the foil and let bake another 5 minutes for any residual moisture from the spinach to reduce off. Serves 2. I plated this with some boxed garlic mashed potatoes I've had hanging out in the pantry. Johnny said it was good, not great. He preferred the salmon and pea puree dish I cooked earlier this month. I have to disagree. This was so full of flavor! It tasted like something you would get at a restaurant. I really loved it, and am sad there aren't any leftovers. I love breakfast for dinner! Johnny? Not so much. But we struck a compromise that I can make it at least once a month. I didn't feel like an elaborate dinner, so I made some delicious apple cinnamon pancakes that hit the spot. Even Johnny had to admit that they were great! Whisk everything but the apples in a medium mixing bowl. Wash and cut the apples in a small dice and fold into the mix. Preheat a griddle pan and scoop the pancakes out using a 1/4 measuring scoop, for even size and cooking. Once the pancake's edges become dried and the whole pancake forms small bubbles, flip it over to finish on the other side. These are best cooked slowly over a medium heat so the apples have time to cook and soften. Makes 14 pancakes using the 1/4 cup measuring scoop. The side of the Bisquick HeartSmart box says that 3 pancakes are 200 calories. However, the addition of other ingredients (vanilla, apple, etc.) will change that number. I left the skin on the apple, which made for pretty pancakes and a nice crunch throughout. In addition to maple syrup, I also mixed sugar and sour cream for another tasty topping option. The apple was moist and soft, with a warm comforting flavor from the cinnamon. I loved these pancakes and will definitely be making them again! Now, for some wedding shoe help!! I know I'm a food blogger, so I threw a feeler out on Twitter and had positive responses that nobody would mind some random wedding/shoe talk. 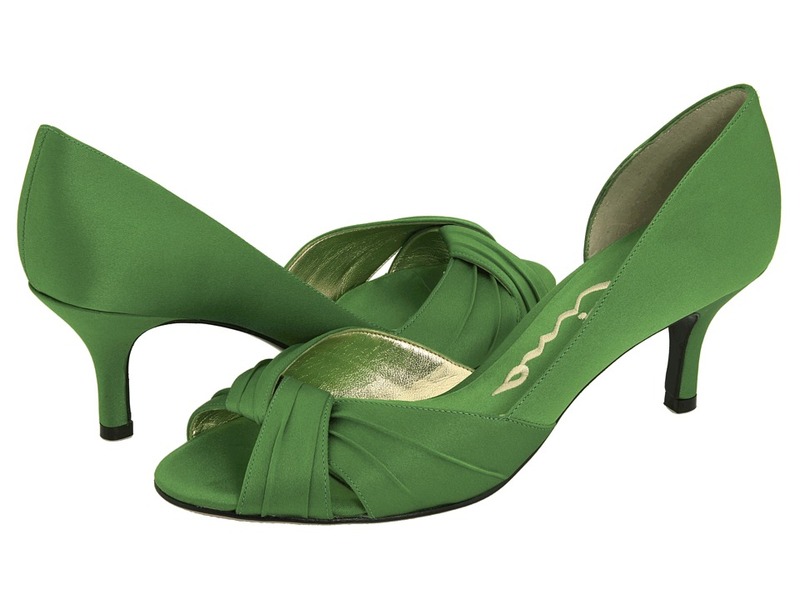 I would like to wear green heels during the ceremony. I had like 20 bookmarked, but have since gone through and with Johnny's help have it narrowed down to four options. Keep in mind that the wedding will be late afternoon/early evening and it will be December. If you run across any other pair of green heels you think I should consider, don't hesitate to e-mail them to me! There really is no story for this recipe. I was browsing around for menu plan ideas and it caught my eye. Not very interesting, sorry! The original can be found here. My adapted version is below. In a large, deep skillet, add the olive oil. Cook the garlic and onion for a few minutes until fragrant. Add the cauliflower, stock, and herbs, bringing to a boil. Cover and let simmer for about 10 minutes until the cauliflower is tender. Mash with a potato masher. Stir in the baby spinach. Let simmer while the pasta cooks to reduce. Meanwhile, bring a pot of water to boil for the pasta. Once boiling, salt the water and add the pasta. Cook until al dente. Add the cheese to the sauce, and stir to incorporate. Drain the pasta, reserving some of the pasta water. Mix everything with tongs in the large skillet. Serves 5-6. This was really yummy! I love cauliflower, but would never think to pair it with pasta. I added a lot of black pepper, so it had a pretty nice kick to it. Feel free to spice it up with any other herbs or spices, depending on your personal preferences. In light of the PFP Challenge, I've been making every effort to make our meals more healthy. I wholeheartedly agree in splurges and indulgences, but in moderation. My weight started to creep up when I let indulgences become an everyday thing. I've turned to cookbooks like these. I have a bunch in my arsenol from thrift stores. Even though I'm not a real recipe-follower, I still own many cookbooks for their inspiration. I like using their recipes as a "starting point" to then add my own to the recipes. Add the liquids and raw vegetables to a large stock pot, and bring to a boil. Add the salt, pepper, and barley. Cook for about 10 minutes until the barley is tender. Add any pre-cooked ingredients (the chicken, potatoes, and any other veggies on hand you want to use up) and let come up to temperature. Makes about 6 quarts - you will have lots of leftovers and some to freeze! This was a delicious, comforting dinner. The tomato broth was a turn from our usual soups. I loved that it was packed with a ton of veggies, it made it filling without being heavy. was lucky #1 -- Laura, the Queen of All! Thanks Laura, for your support of Friday Firsts this year! I'll set you up with your gift certificate today! Spread the word: If you refer another person to link up you will EACH get one (1) additional entry. Just let me know in the comments who referred you/who you referred and you'll both get a free entry! 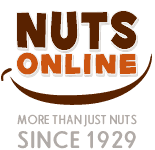 The winner will receive a $25 gift certificate for one of my favorite sites - nutsonline.com! This is a fantastic, family-owned company that I love. They sell an awesome assortment of goodies and I've always been pleased with their customer service and quality. The give away will be open from 12:00 a.m. (CST) Friday, February 18 until the entry form closes at 12:30 p.m. (CST) Saturday, February 19th so act quick! I will announce the winner later in the day Saturday. I've been having a blast reading a series of books I checked out from my local library, so I thought I'd share with you. The author's name is Diane Mott Davidson and she writes culinary mysteries. They're centered around a caterer as the main character. She finds herself in all kinds of situations, sometimes deadly, which results in a mystery. It's kind of like a grown up Nancy Drew with some Food Network thrown in! The cool thing is, when she is cooking in the book, the next page will list the recipe. So, if she is stressed and baking a big batch of cinnamon rolls, you turn the page and the recipe for the rolls is right there! The titles are all kinds of puns too, like The Cereal Murders and Dying for Chocolate. If you're a reader, or you like mysteries check them out! They're cute! I heard about this idea from Beth (aka Biz) and have been meaning to make it for a couple weeks now! First, I roasted a whole bird. Nothing fancy, just rubbed with olive oil, salt, and pepper. It was a 4-5 lb. fryer and took about an hour in a 350° oven. I used just the breast meat for the pot pie. The rest of the bird I'll use for something else and the carcass for stock. Combine flour and salt in a mixing bowl. Mix oil and 3 Tbsp milk and add to the bowl. Use a fork to mix everything until dough forms a ball. Add up to 2 Tbsp more milk if necessary. Form into a ball. Roll out onto wax paper and then transfer to the top of your baking dish. Cut a few slits in the top and bake at 350° for 30-40 minutes. Let sit 10 minutes before cutting. This made a LOT! I'd say serves 6, easily. One note: I got nervous about the gravy level, so I had added a bit more water at the end. This was a mistake because it ended up really, really watery. So, we ate it in bowls with the crust scooped over top. It was still delicious, and I adjusted the recipe above to reflect the new gravy amount I'd recommend! I liked the crust, it was tender and flaky. I'd never made a crust like this before. Usually I cut in lard or butter! Happy Valentine's Day everybody! Johnny and I celebrated yesterday by going to one of our favorite places in the world, Lincoln Park Zoo. My special gibbon friend, Caruso, had a baby, so we wanted to go check him/her out! Awww! Just one month old! I have stopped weighing myself everyday because I'm not a fan of the constant reminder, or seeing it go up and down .2 pounds here and there. I am down 5 pounds since my weigh in last week, but I'm not sure how accurate that is. We did not eat out once this week, I made sure to stick to the meal plan. When others hanging out with us got fast food, I passed. We walked a lot at the zoo and also every time I go to the store I park at the end of the parking lot for the extra exercise. She is down 1.5ish pounds! She has already lost 12 pounds on her own before joining the challenge!! She's down 3.8 pounds this week and accredits it to not drinking. She is officially down 1 pound! She avoided temptations at work and bypassed the treats and extra large cookies from a luncheon! If you already have a Netflix account, it is a great place for workout and exercise DVDs. If you have streaming, all the better! I've streamed videos on my computer and through our Wii. I love it because you can try out a bunch of different types of workouts without the expensive of purchasing them only to find out you hate them!